Blue Origin studies how it could repurpose the upper stage of New Glenn to serve as habitats or other commercial facilities in orbit as part of a NASA-funded study. That study was part of a series of study contracts awarded by NASA last August to study future concepts to support commercial human spaceflight in low Earth orbit. "We focused there on the reuse of the second stage of New Glenn and what we might be able to do with that volume and capacity once we're on orbit," he said during a panel discussion about low Earth orbit commercialization at the American Astronautical Society's Goddard Memorial Symposium here March 20. "We don't have actual plans at this moment" to reuse the upper stages in those ways, he noted. "We'll see what the best approach is at the end of the day." Development of New Glenn remains on schedule to support a first launch in 2021. The total cost of the New Glenn program is "north of $2.5 billion," he said, including $1 billion for facilities in Florida where the rocket will be assembled and launched. 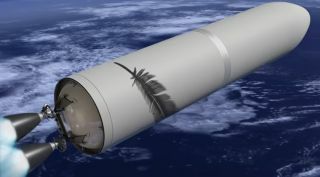 "There's a grand opportunity there," saying that reused upper stages could be used for manufacturing applications in addition to habitation. "It's going to take simple steps to get there." Other points on Cummins' slide about the study emphasized the importance of public-private partnerships, development of an "ecosystem" of capabilities in low Earth orbit and the ability for companies that invest in hardware for the International Space Station to have guaranteed access to it.